It’s not difficult to understand why Nat ‘King’ Cole was so loved and respected as a singer and pianist. With his jazz leanings, his blues undertones and a voice as smooth as silk he appealed to just about everyone…Black or White. Along with Louis Jordan, the man they dubbed the ‘King of the Jukeboxes and Louis Armstrong, Nat blazed a trail for Black performers in America. According to Time magazine, "He wasn't corrupted by the mainstream. He used jazz to enrich and renew it, and left behind a lasting legacy. Very like a king." He was the first black performer to have his own regular radio show and later he s became the first to have his own regular TV show. His approach to the tensions created by segregation was a softer, less confrontational than by some and yet his quiet, dignity helped to make a difference in America. Nathanial Adams Coles’ family moved from Montgomery, Alabama, where he was born in 1919, to Chicago before he was five years old. As a child he sang in church, his father was a preacher, and was encouraged by his mother who was an amateur pianist. His ability to ‘pitch-perfect’ and seemingly able to quickly pick out a tune on the piano made it seem that Nat was bound for a life in music. His father was none too keen on the idea of a life spent playing the sort of jazz and blues that his son liked to listen to on the radio. His older brother Eddie who played bass encouraged him and soon the two were leading a band that played on Chicago’s south side. Things seemed to come to abrupt halt for sixteen-year-old Nat when Eddie left to join an orchestra in New York. However that didn’t last long and Eddie was soon back in Chicago and the brother’s band was now going out as Eddie Cole and His Solid Swingers. He made his recording debut in July 1936 for Decca with brother Eddie’s band; the influence of Earl Hines playing style, particularly on Honey Hush, can be heard in the piano breaks. Nat also had his own band and he would frequently play Hines’ arrangements. 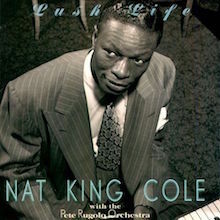 Soon after Nat recorded for the first time he left Chicago and ended up in Los Angeles, the beginning and the end of Route 66; which would become one of Cole’s biggest hits in1946. He had fallen for a dancer named Nadine who had persuaded the producers of a revival of Eubie Blake’s revue, Shuffle Along to let Nat play the piano. The show was touring and on the way the two of them got married and although the show was far from successful by the time they ended up in California they decided to stay. Playing up and down the California coast the band began to gain a solid reputation and Nat in particular was drawing admiring comments from the jazz fraternity and particularly other piano players who marvelled at his talent. He also gained the moniker ‘King’ from a club owner; it certainly stuck. Eventually Nat was offered a residency at the Swanee Inn on North La Brea Avenue, just south of Hollywood. The place was small so a three-piece was the only option – the King Cole Trio was born; Nat enlisted bassist Wesley Prince and guitarist Oscar Moore to play with him, and inspired choice as both men were well known in Hollywood studios added to which the three of them got on really well. 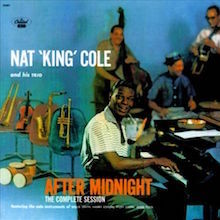 The first time they recorded in 1939 they did so as King Cole’s Swingsters, over the next three years they laid down some great jazz as the King Cole Trio with songs such as ‘Hit That Jive Jack’ and ‘I Like To Riff’ that are firmly rooted in the genre. Then in July 1942 Cole recorded with saxophonist, Lester Young and bass player Red Callender. Amongst the sublime sides were ‘I Can’t Get Started’, ‘Tea For Two’ and ‘Body and Soul’. 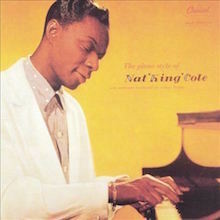 The impeccable performances and especially Nat Cole’s piano playing show off his jazz credentials and instantly negate any critic who sees the man as just a ‘nice crooner’. In November 1942 the King Cole Trio recorded, ‘That Ain’t Right’, which went to No.1 on the R&B charts. The following year ‘All For You’ repeated the success as well as crossing over onto the Billboard chart. A switch to the newly formed Capitol Records brought national recognition when, in early 1944, ‘Straighten Up and Fly Right’ became a big hit; it was apparently the theme of one of his father’s sermons. Later in 1944 Cole appeared at the very first Jazz at the Philharmonic along with Illinois Jacquet, Jack McVea and other jazz stars. 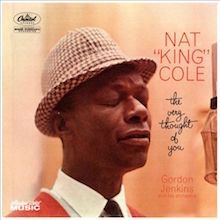 Following his switch to Capitol Nat King Cole was rarely off the Billboard best sellers list. While he worked with big studio orchestras from 1946 onwards his earlier work owed more to the juke joints than to the ballrooms and concert halls. After playing at the Paramount in New York with the Stan Kenton Orchestra in 1946 Cole got a radio series becoming one of the very few to get commercial sponsorship during a period when ‘white was still right’ as far as advertisers were concerned. Nat’s drift away from his roots continued and there was a change in his personal circumstances when he divorced Nadine and married Maria Ellington. His new wife’s background was solidly professional Boston, a good deal more upper class than show-biz; this despite the fact that Maria sang with Duke Ellington’s Orchestra – although he was no relation. Such was Cole’s success on Capitol that it was the revenue from the sales of his recordings that helped the label to become so important. In 1948 Cole recorded ‘Nature Boy’ with a string orchestra; it was a smash hit. The song’s composer, eden ahbez (he liked his name spelled in lower case) lived, so legend has it, underneath the first L of the ‘Hollywood’ sign on Mt. Lee in the Hollywood Hills. ahbez who was born Alexander Aberle in Brooklyn, New York in 1908 had written his song about a "strange enchanted boy" "who wandered very far" only to learn that, "the greatest gift," "was just to love and be loved in return." One day ahbez hustled Nat Cole’s manager, giving him a manuscript copy of the song. Cole immediately recognized the old Jewish melody of the song, but liked the words and decided to record it. It’s arguably the song that changed Nat Cole from a jazz singer to a popular singer. Nevertheless his influence had spread to many jazz piano players including Errol Garner, Bill Evans, Charles Brown and Ray Charles. For the next two decades Cole was one of the biggest thing on the R&B charts, and no slouch on the mainstream Billboard charts, as his records increasingly crossed over to the white audience. Interestingly, one of his best-known songs, ‘Unforgettable’ (recorded in 1951), was not one of his biggest single releases. For such a mild mannered man and a singer of some of the most romantic ballads to come out of the 1950s it’s perhaps strange now to think that Cole should find himself at the centre of some very unpleasant controversy in 1956. Cole was on tour with the British bandleader, Ted Heath and his orchestra in Alabama when he was attacked by some white men for daring to appear on the same bill as a white band. Rather than trade insults with some bigoted sections of the community Cole decided to do things in a different way. He supported the Civil Rights movement with money, culminating in1963 when he announced that he was giving $50,000, worth close to $400,000 today, to organizations fighting for civil rights in the South. He pledged the money from his concerts in Los Angles that were sponsored by the National Association for the Advancement of Colored People. His gesture led to other black performers doing likewise. Cole, a heavy smoker, was diagnosed with lung cancer in 1964. He died the following year, aged 45. In March 2000, with Ray Charles as his presenter, Nat King Cole was inducted into the Rock and Roll Hall of Fame. The man who once said, “Critics don't buy records. They get 'em free,” was a twentieth century great who died far too young. He left us with one of the most wonderful recorded legacies ranging from pure jazz to sublimely romantic ballads. As Nat himself once said, “Singing a song is like telling a story. So I pick songs that I can really feel.” And that is what characterises his approach to a song…but never forget he was also a great jazz piano player. 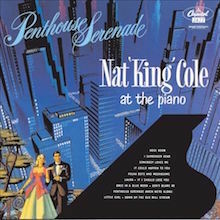 The year after he had formally disbanded his trio to turn his attention to vocal pop music, Nat King Cole reversed himself and went into the studio with guitarist John Collins, bassist Charlie Harris, and drummer Bunny Shawker and recorded the eight-song 10" LP Penthouse Serenade, a quiet, reflective set of standards like "Somebody Loves Me" and "Laura" that he performed instrumentally at the piano. The album confirmed that, whatever success he might be having as a singer, he hadn't lost his touch. 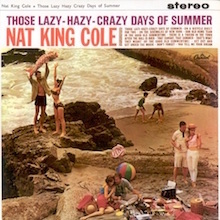 The Top Ten success of Nat King Cole's spring 1963 single "Those Lazy-Hazy-Crazy Days of Summer" sent him into the studio to record a complementary LP of songs that either dated back to the turn of the century or sounded like they did. Working with a big chorus and an orchestra that included such old-fashioned instruments as the banjo, arranger/conductor Ralph Carmichael accompanied Cole on period songs like "After the Ball Is Over" and "In the Good Old Summertime." In addition to its nostalgic appeal, of course, the music had much of the flavor of one of Mitch Miller's singalong records. It wasn't one of Cole's more inspired efforts, but he took to the concept with enthusiasm and produced a disc full of catchy, lighthearted performances in the same mood as the hit single. This is a very interesting transitional collection featuring Nat King Cole when he was gradually emphasizing his vocals over his jazz piano playing and phasing out his trio. All 25 of the selections on this generous set feature the arrangements of Pete Rugolo; highlights include "Lush Life," "Time Out for Tears," "That's My Girl," "Red Sails in the Sunset," "It's Crazy," and "You Stepped Out of a Dream." There is enough jazz content and popular appeal on this CD to satisfy both of Cole's audiences. 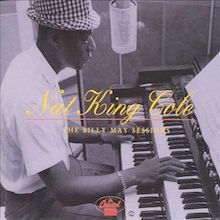 Nat King Cole recorded with arranger/bandleader Billy May on several occasions and all of their collaborations are on this excellent double-CD The Billy May Sessions. Dating from 1951, 1953, 1954, 1957 and 1961, some of the more memorable numbers include "Walkin' My Baby Back Home," "Angel Eyes," "Papa Loves Mambo," "Send for Me," "Who's Sorry Now," "The Party's Over" and "When My Sugar Walks Down the Street." Cole also takes organ solos on three of the selections from 1961 (the only time he ever recorded on that instrument), though he plays no piano on this set. It's recommended for his superior middle of the road singing. 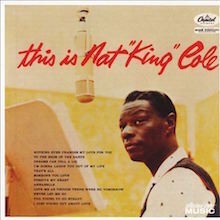 Capitol Records took This Is Sinatra!, a compilation album, into the Top Ten in early 1957, which probably prompted the label to assemble a similar collection, This Is Nat "King" Cole, later in the year. Consisting of tracks not previously issued on a Cole LP, the disc contains seven recent Billboard singles chart entries among its 12 selections -- "Too Young to Go Steady" (which reached number 21), "Forgive My Heart" (13), "Nothing Ever Changes My Love for You" (72), "To the Ends of the Earth" (25), "I'm Gonna Laugh You Right Out of My Life" (57), "Someone You Love" (13), and "Never Let Me Go" (79) -- while an eighth song, "That's All," was the B-side of the 1953 Top 20 hit "Lover, Come Back to Me!" "Too Young to Go Steady," which peaked in April 1956, turned out to be all that was really heard of a stage musical intended for Broadway, Strip for Action, with songs by Jimmy McHugh and Harold Adamson, which closed out of town. "I Just Found Out About Love" and "Love Me as Though There Were No Tomorrow," two more songs from that ill-fated show, are among the previously unheard tracks unearthed for this compilation. "I Just Found Out About Love" is the only uptempo number on the LP, with all the others being dreamy ballads. Nelson Riddle arranged and conducted throughout, as well as co-writing another of the previously lost songs, "Annabelle." Cole as usual gives warm, confident readings of all this material, and fans welcomed the packaging of some songs previously available only on singles, taking the LP to number 18 in the fall of 1957. But with the possible exception of Bob Haymes and Alan Brandt's "That's All," there aren't any memorable compositions here. 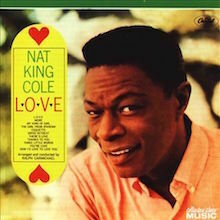 Bert Kaempfert and Milt Gabler's bouncy, upbeat song "L-O-V-E" was the B-side of Nat King Cole's 1964 Top 40 single "I Don't Want to See Tomorrow" and even grazed the bottom of the singles chart itself, and when it showed signs of international popularity, it became the focus of a full-length Cole LP of the same name, with the rest of the tracks recorded in the first few days of December (after an earlier session in August reportedly produced unsatisfactory results). This proved to be Cole's final LP project before his death from lung cancer in February 1965. Little evidence of his illness can be heard on the finished tracks, although the singer is at times a bit huskier than usual, and even introduces a bit of a growl during "My Kind of Girl." The arrangements seem patterned after that for L-O-V-E, which is to say that they are gently swinging in a big-band style. Conductor Ralph Carmichael adds a Dixieland flavor here and there, but for the most part, his charts are straight out of the Swing Era, and Cole matches the horns punch for punch. The selections sometimes date back to before the Swing Era, notably the standards "Coquette" and "Three Little Words," but there are also Cole readings of then-recent easy listening hits "The Girl from Ipanema" and "More." The recordings are virtual duets with trumpeter Bobby Bryant, whose solos earned him credit on the back cover. L-O-V-E is just another well-performed swing album for Cole that happened to be his last. Nat King Cole possessed one of the most accessible and appealing voices of any singer in the 1950s. 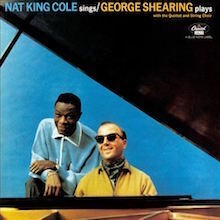 This ballad-oriented set puts the emphasis completely on his voice (there is no piano playing or any hint of his jazz-oriented past) and features Cole accompanied by Gordon Jenkins' sweet arrangements for a string orchestra. Many other singers might find it difficult to overcome, much less uplift this type of accompaniment, but Cole's basic and honest delivery works quite well in this setting. Highlights include "The Very Thought of You," "But Beautiful," "This Is All I Ask," "For All We Know," and "The More I See You."